As Great Shortstops Week continues here at Papergreat, here's a neat relic concerning New York Yankees shortstop Derek Jeter, who is currently in the 20th and final season of his Cooperstown-bound baseball career. 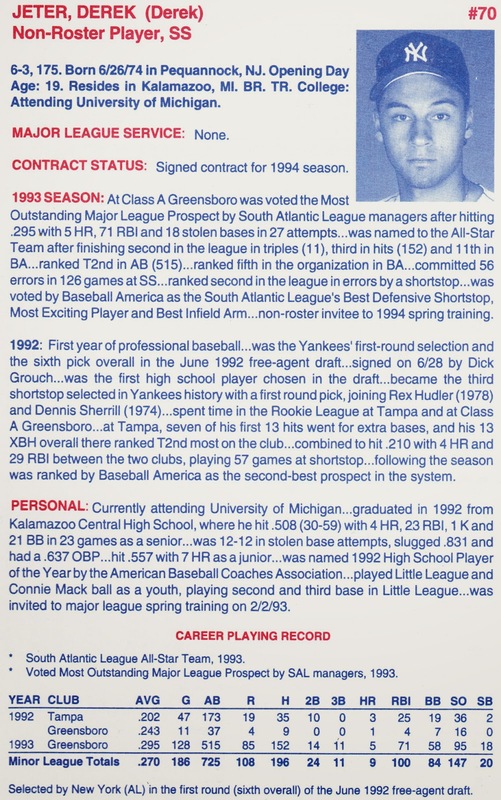 Shown above is Jeter's page in the Yankees 1994 Information Guide, a publication intended primarily for members of the media. 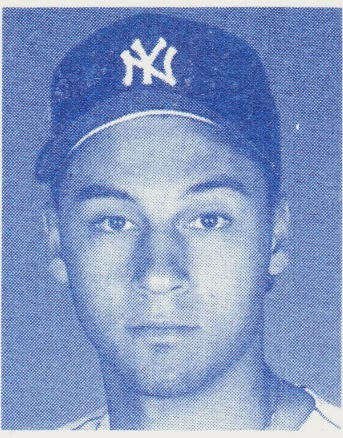 This is back when Jeter was a non-roster player attending the Yankees' spring training as a teenager. He was issued the nonglamorous uniform number of 70. Jeter has done a little better than those two. "Captain Clutch" has 3,371 career hits (as of today), has scored 1,894 runs, has compiled a .311 career batting average ... and has five World Series rings. He has played almost exactly a full regular season of postseason games — 158. In those 158 playoff games, he has 200 hits, 111 runs scored, 20 home runs and a .308 batting average. His postseason OPS is a remarkable .838. But this was before all of that. After spring training in 1994, he barreled through the minor leagues, spending time at Class A Tampa, Class AA Albany-Colonie and Triple-A Columbus. He batted well above .300 at all three stops. Jeter made his major-league debut in May 1995, and the rest is history. And, yes, there's an apostrophe missing in that advertisement!